Tigridia pavonia (Mexican Shell Flower) growing in a modern garden. 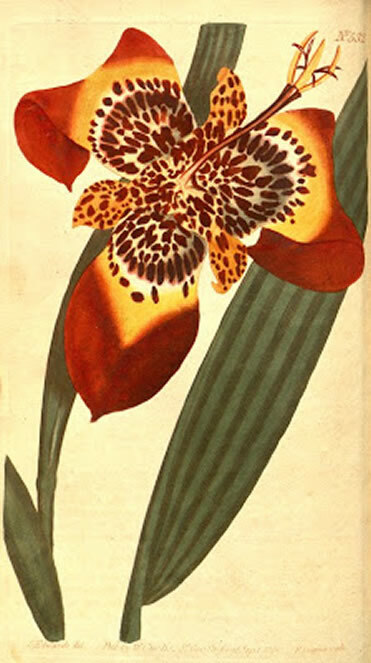 Tigridia pavonia (Mexican Shell Flower) from Curtis's Botanical Magazine, vol. 15, t. 532 (1801). 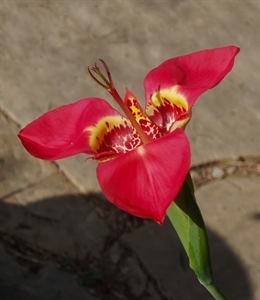 Description: Tigridia pavonia (Mexican Shell Flower) is a member of the Iris family (Iridaceae). The Hortus Kewensis, ed. 2, vol. 4 recorded that this native of Mexico was introduced to Britain about 1796. 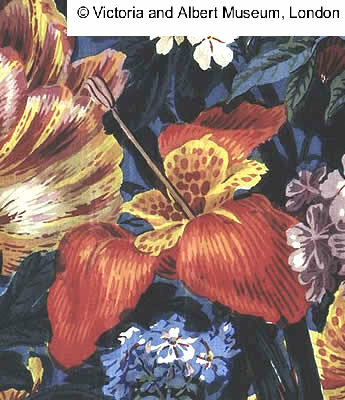 This agrees with Pierre-Joseph Redoute's Choix des Plus Belles Fleurs in which he states that these plants were grown in European gardens since the end of the 1700s. 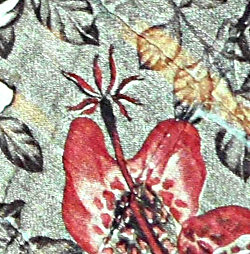 This Iris ensata is spotted and is organized in layers of 3 structures per layer, but lacks the columnar reproductive structure clearly seen on all three of the Tigridia pavonia pictures above. 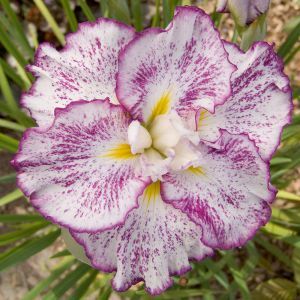 This flower is also a modern cultivar not known in the early 19th century. 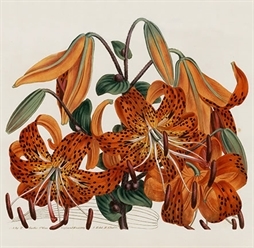 This spotted Lilium lancifolium (Tiger Lily) is close in color to Tigridia pavonia in the pictures above, but it has 6 same sized petals and its reproductive structures are not fused into a column as in Tigridia. This is the Chinese Tiger Lily rather than the North American Tiger Lily but both are similar in structure. 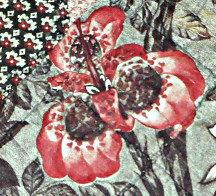 Botanical illustration from Curtis's Botanical Magazine, 1810, vol. 31, t. 1237. 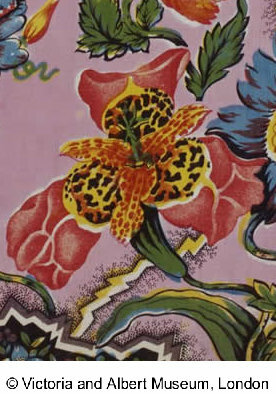 This spotted, triangular Masdevallia bella orchid has an obvious lip (note illustrations at bottom left) rather than the columnar reproductive structure clearly seen on all three of the Tigridia pavonia pictures above. 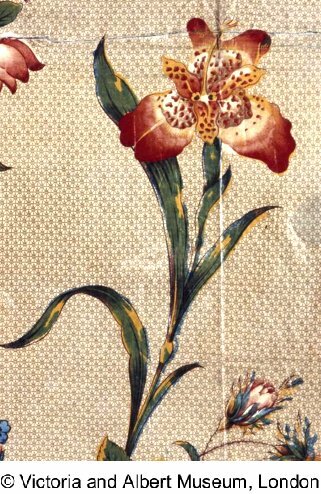 Botanical illustration from Cogniaux and Goossens, Dictionnaire iconographique des orchidees vol. 10. 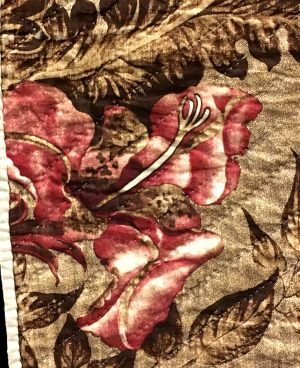 Furnishing Fabric Circ.366-1956, the Victoria and Albert Museum, London. 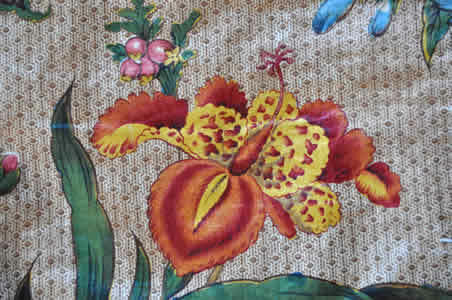 Furnishing Fabric T.11-1933, the Victoria and Albert Museum, London. 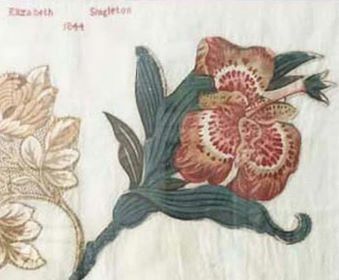 At least one other 19th century Tigridia pavonia (Mexican Shell Flower) motifs is known from a private collection, but pictures are not available at this time. *Some of these citations come from Kay & Lori Lee Triplett and Xenia Cord, Chintz Quilts from the Poos Collection, (Saint Etienne de Montluc, France :Quiltmania Editions, 2013), 294.